HOBBY FARM JUST NORTH OF DOWNTOWN CORNING!!!!!! Main house has 3 bedrooms and 2 baths with just over 1300 square feet of lovingly restored country charm. The roof was replaced in 2005. Chef's dream kitchen with granite counters, newer stainless steel appliances and copper farm sink. Beautiful low maintenance laminate wood floors with heated tile in the bathroom. Enjoy the rainy winter evenings by the propane stove. Pick fruit from your own fruit trees! Chickens will stay warm and dry in their own coop with run. Six stall mare motel for your horses, or smaller three stall enclosed horse barn, or both! 46'x49' barn with concrete floor to store your hay and mini tractor. Enclosed horse stall/grooming pen, even a place for your guests or caretaker. Two bedrooms and a full bath in the barn bunkhouse with 578 square feet of space! RV Hookup, fenced pasture, hay barn, chicken coop, three stall horse barn, wellhouse. So much to list here, you have to see it to believe it. 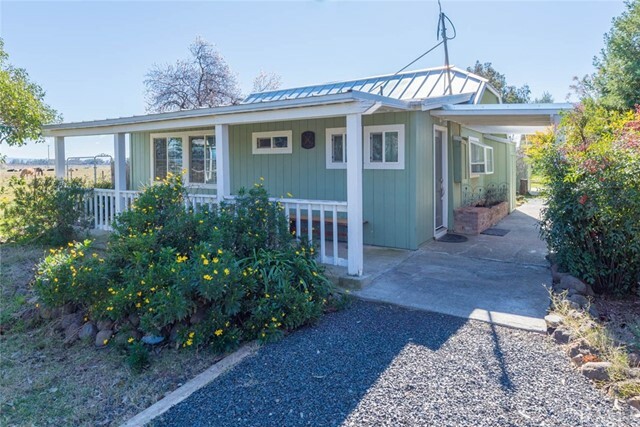 Come live off the land in the country and enjoy the peace and quiet, only 35 minutes to Chico. Class 2 and 3 loam soils with El Camino irrigation water rights. Please use Trust Advisory in supplemental docs, property in a trust. Listing Provided By Kara Priest of Parkway Real Estate Co.